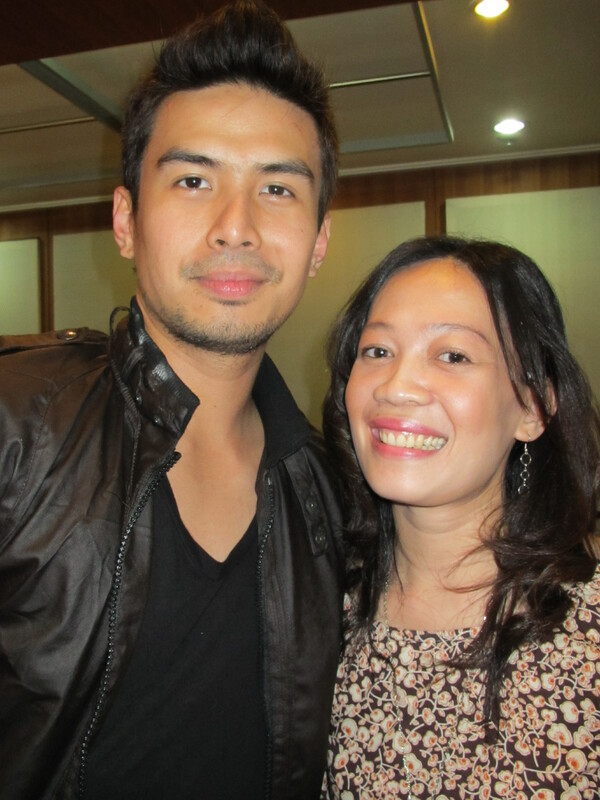 I have never been an avid fan until I heard this hunky balladeer named Christian Bautista sing “Tell me your name, you’re lovely please tell me your name”. It’s as if I’m serenaded by a handsome and rare gentleman on earth (I’m dreaming much here guys). Is it something in “The Way You Looked at Me” that charmed my heart and the rest of Asia? Whatever it is I know I’m happy doing things a fan girl would do for the love of the Asiansation. Time stops every time he performs in ASAP and has TV appearances. I have watched his mall shows and never fails to get his CD albums autographed and of course had pictures taken beside him. I remember thinking of enrolling at Gold’s Gym when I saw his hunk physique in a billboard along my way. I eventually did, crazy right? I love following his tweets and he’s the very reason why in I signed up in Twitterlandia. 🙂 I can’t contain the excitement and been all smiles for a week when I got a re-tweet from him on a twitpic I posted for the red carpet premiere night of his first international movie A Special Symphony. Yes I was there too with free invites I won online. In that instant I joined his undying support group, aka fans club Christian Friends. I thought this is the most I can do for him until last Sunday November 13, I got a chance to see Christian in a whole new light. 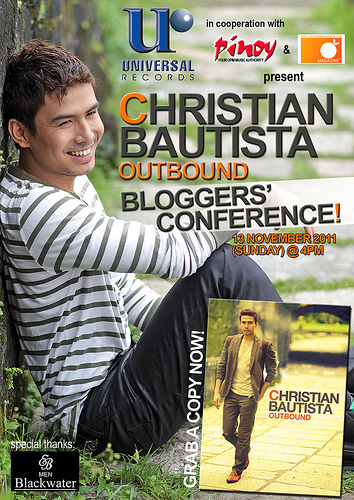 I’m privileged to be invited and be part of his very 1st Bloggers Conference at Universal Records office. Once again I’m face to face with Christian but this time not as a fan but an official blogger! I have levelled up as a fan and as a newbie blogger. If before I’m just reading online articles, interviews and watching video clips about Christian’s career and life that Sunday afternoon I got the first hand news straight from him. I even had a surreal moment to ask him a question. This was my first time to join a bloggers conference and it’s for this ultimately charming Asian idol, no wonder that it took a long while before I managed to ask him one. Mine is the 2nd to the last question. 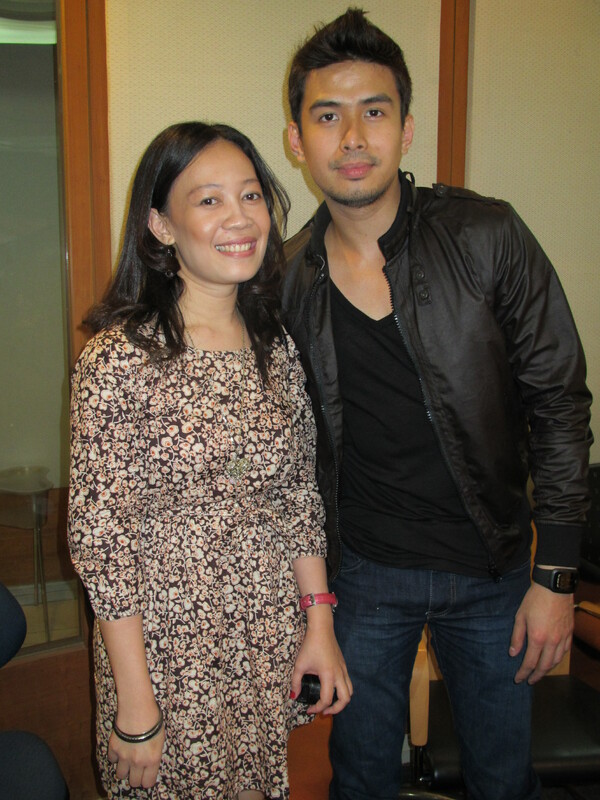 Truly a different Sunday for me but my experience is not an inch compared to how Christian Bautista’s career soared high rooting from his humble Star in a Million days. From a 4x Platinum Record Award for Romance Revisited: The Love Songs Of Jose Mari Chan for 2011, to his first international film A Special Symphony, tohis currently playingfirst Pan-Asian musical TV series The Kitchen Musical. He worked with Grammy-nominated pianist Jim Brickman, K-Pop R&B trio One Way, and fronted for the concerts of K-Pop sensations Rain and2NE1. He also top billed jampacked concerts here and abroad. He also has numerous endorsements tucked under his belt coupled with billboards all over the Metro and has consistently won numerous awards and citations. Clearly there’s no stopping the Asiansation from giving us best class offers. He arrived at the conference just fresh from another award as an Exemplary ASEAN Youth in the Field of Entertainment by the National Youth Commission. 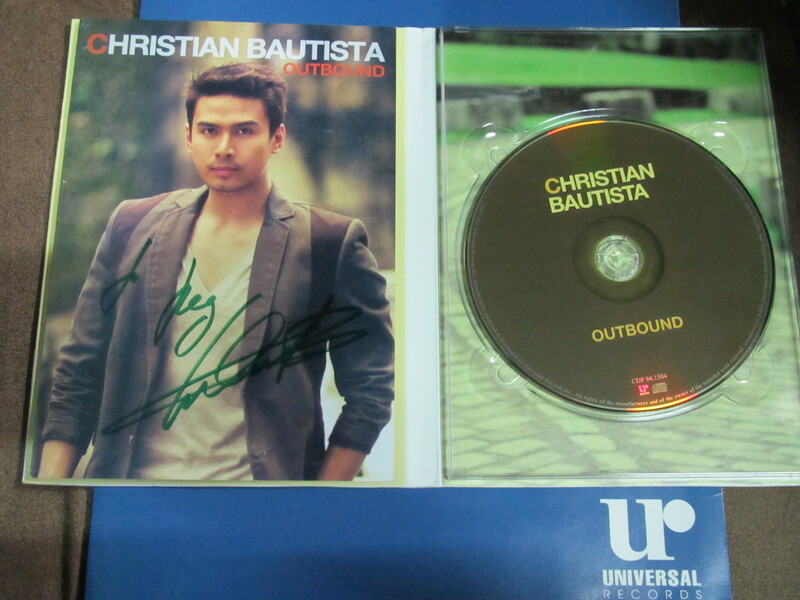 And now the Asiansation adds another feather in his cap as he launches his first International album Outbound. OUTBOUND features Christian’s collaboration with music producers and artists he met and worked with from the United States, Korea, Japan, Singapore, and Indonesia. The album consists of eight songs which is a good mix of slow and upbeat ballads. The first single All That’s Left offers Christian’s new, bolder sound, and further proves that he is more than just a balladeer. “Slowly nag-build up kasi ‘yan because of The Kitchen Musical. Parang nabigyan ako ng confidence to try something na kakaiba, na mas current na contemporary. So I told myself, sige let’s try this,”says Christian. 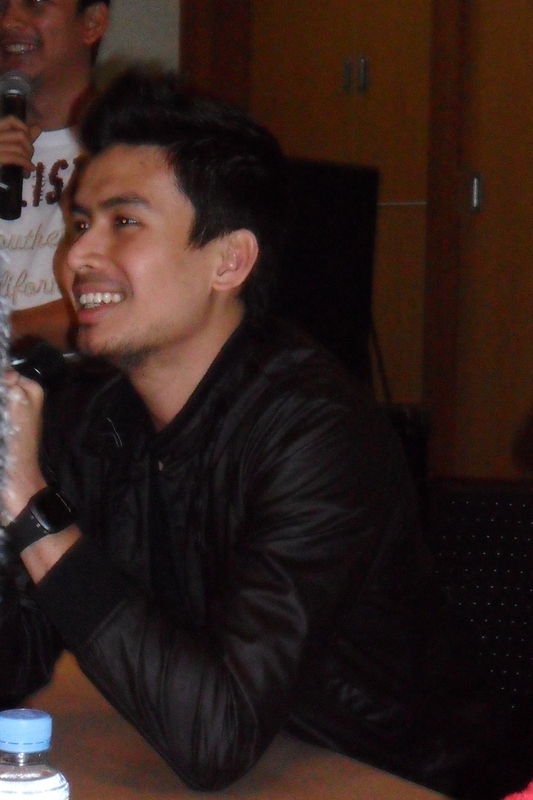 In the music video of All That’s Left which features CosPlay Queen Alodia Gosiengfiao, you cansee a dancing Christian Bautista as he sings this upbeat but still romantically written song. One word, Wow! While taping for The Kitchen Musical, Christian never stopped to get in touch with some of the region’s movers in the music industry until he met Tat Tong of Singapore, composer of the anthemic All That’s Left. Tat’s other masterpieces-original songs in Outbound include What Can I Do and his masterful arrangement on Christian’s cover of George Michael’s Faith, which is very special for Christian because it was used in his first big solo number in The Kitchen Musical. Outbound also gathers its noteworthy works with Grammy-nominated multi-platinum instrumentalist Jim Brickman for Never Far Away, the K-Pop R&B trio One Way for Wrong Number, Indonesian songwriter Satrio for the hit song I’m Already King, and with Avex Japan’s amazing Baby M for the lovely duet Sakura. Before going to this bloggers conference I got the chance to listen to the entire album. My instant favorites are All That’s Left and What Can I Do and after the event I know why. 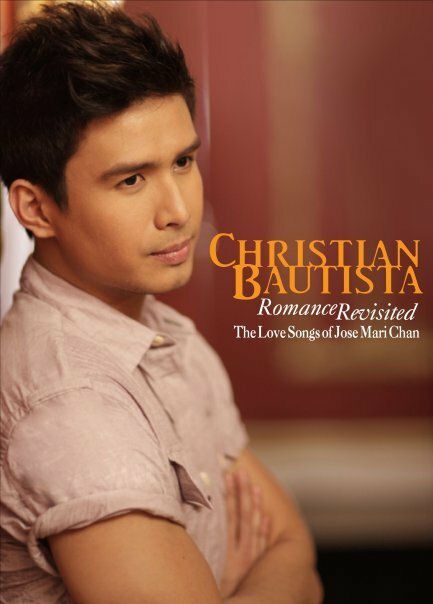 Christian wrote the catchy romantic part of the chorus “You bring out the best in whatever’s left of me” for All That’s Left. What Can I Do is close to his heart as he fully wrote the song’s lyrics with Tat Tong on the melody. They both have the feel of the classic Christian Bautista ballads though there’s a clear difference in the sound. All That’s Left is refreshingly upbeat while the melody for What Can I Do is Cantonese/Taiwanese sounding (a heaven for an Asianovela fan like me). Here is the album Preview for your listening pleasure. He was also asked on how this change helped him. He mentioned that this international collaboration and new sound brought him to have a more driven image or more opinionated saying what he wants but stays diplomatic. On the negative talks of him he answered it straight – “Some said I’m being trying hard or Kumi-kpop, eh kailan ko pa to i-try? Now is the best time whether the people like it or not”. Good answer Ian! 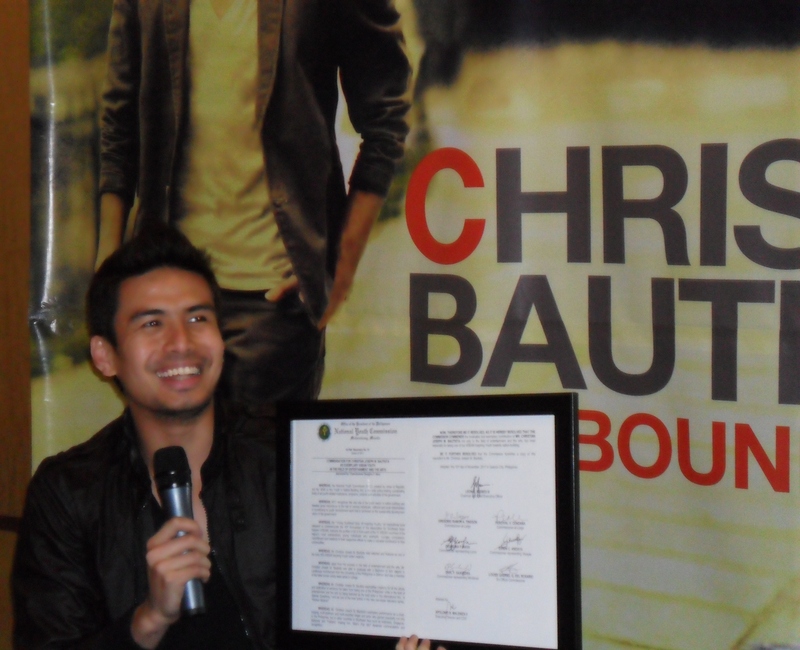 With all these career highlights to envy, the balladeer remains humble and thankful for all these blessings. The atmosphere in the conference room was very light and cool you would not think we are talking to an Asian idol. He gamely answered our questions and even cracked jokes and shared casual laughter with us as if we are all friends in the room. Maybe that’s his charm. He remains the simple hopeless romantic inside while he tries to go out of his comfort zone. He may have drifted from his original sound but he’s still the same Christian we love – as he narrated when he gets inspired by something he immediately put that thought on his BlackBerry phone and then later use this compilation to write a song. So melodramatic of him, right? 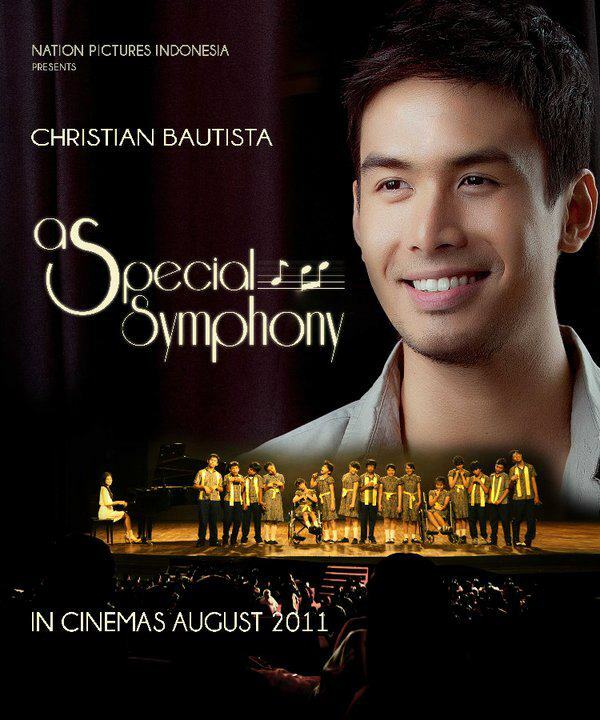 As a fan I know I miss the classic and simple sound of Christian Bautista but can’t deny that I heart him more now. Christian: [Smiling as always] your name? Christian: Hmm, short for Regina right? Lovely name. Me: Speechless. Yup. [Yey!] Thank you. After that switching mode I finally came into senses and talked amongst the bloggers after the event. It’s a weird and overwhelming feeling to be in there and learning much from the blogging experts as we are served dinner. As soon as the second batch of bloggers was done I saw Christian about to go out of the conference room. For the last time I want to approach him and I was shocked on what he said – “Oh, you’re still here”. Talk about recall, he recognized me, happiness! That completes the day with of course another photo. On a more serious note, my ever dream is to write a book someday so this pseudo experience of being a journalist in a blogger’s hat is heaven for me. As I pose with the fellow bloggers and of course the man of that afternoon Mr. Asiansation Christian Bautista, I could never thank enough the people who made this happen. All of us enjoyed the time with Christian. 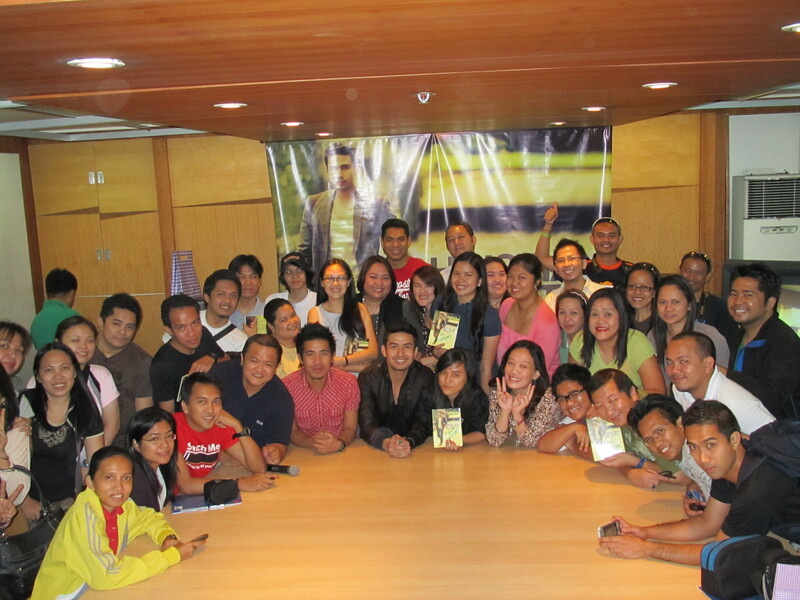 The bloggers just love him and after the event the non-fans became instant fanatics. 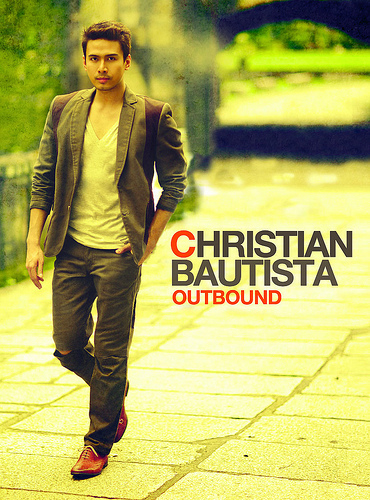 Surely Christian can go much far than Outbound. Watch out for his major concert next year (I heard from a twitter buzz it’s going to be a Valentine concert). Expecting more dance moves from him there aside from All That’s Left and the famous Faith and Nobody cover from The Kitchen Musical. Also it won’t be surprising if his dream to conquer US and Europe would come true in the near future. 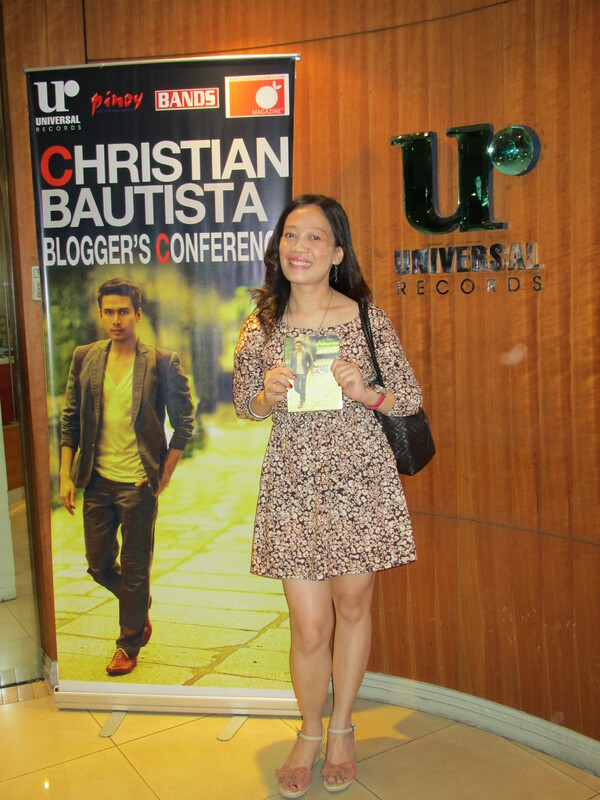 Thank you very much again to Universal Records in cooperation with Pinoy Magazine and official online partner Orange Magazine TV for bringing Christian Bautista’s Bloggers’ Conference. Special thanks to Ever Bilena Blackwater. Outbound is out now in all major record bars nationwide under Universal Records. 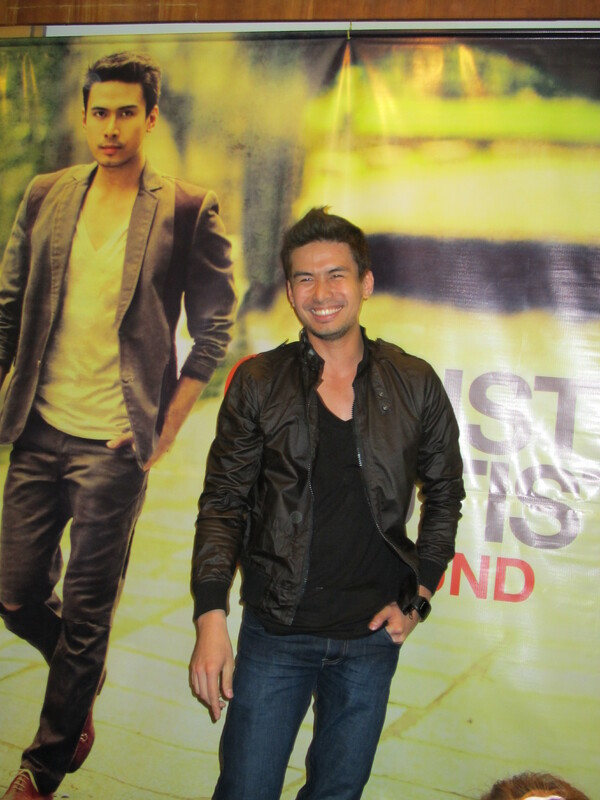 FREE Christian Bautista “ALL THAT’S LEFT” Ringback Tone! For GLOBE users text UD344 and send to 2332. For SMART users text FALT and send to 2728. Text GetSong[space]6151903 to 2728 for SUN users (P15 for 15 days). A Happy Birthday Blog: Who is the Birthday Boy Song Joong Ki to Me?